As the Uncle Tetsu chains expands across the GTA, their menu continues to multiply as well. 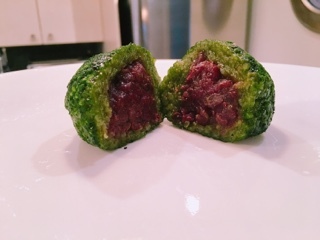 The latest location, HCafé Japanese Café, is situated in the Emerald condominium at Yonge and Sheppard. 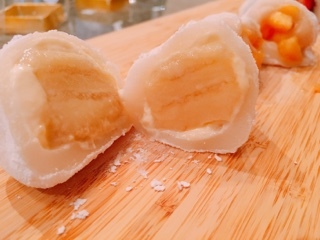 The small retail store not only offers all the cakes (Japanese cheesecake, no-bake cheesecake, and zuccotto) and smaller pastries (rusks and madelines), but also a new line of mochi as well. 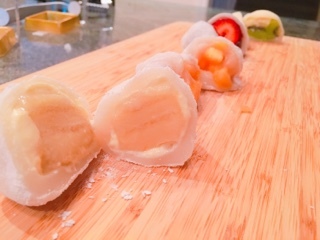 There’s the traditional mochis ($3.10), the wrappers made of sticky rice and filled with a flavoured paste and rolled in spice. 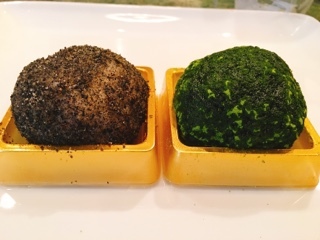 You have to really like the herbal tastes of green tea to get the matcha one as the unsweetened dusting on the mochi is the first ingredient to hit the tongue. 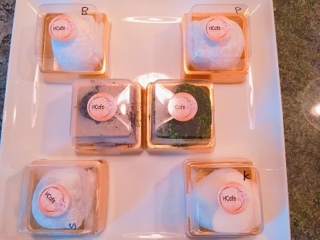 Instantly, the golden bitter green tea essence floods the mouth before you get to the sticky rice and finally the sugary red bean paste that mellows out the dessert. 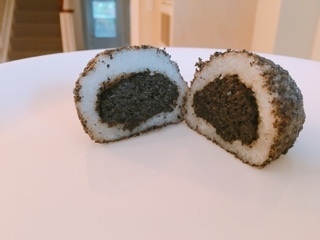 For something sweeter, the black sesame incorporates ground seeds on top and a sizeable hunk of sweetened paste in the middle. It’s a safer bet for Japanese mochi newbies. Delicate cubed fresh peaches with whipped cream that’s the messiest to eat, but nice and light. Frozen slices of bananas with the same cream, which if you leave half an hour starts to defrost and turns creamy. 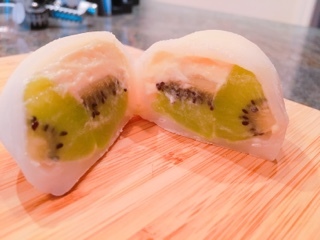 Whereas, the frozen kiwi takes a bit longer to melt, so if you’re like me and can’t wait long enough, it’s like biting into a fresh fruit popsicle - rather refreshing during the summer. 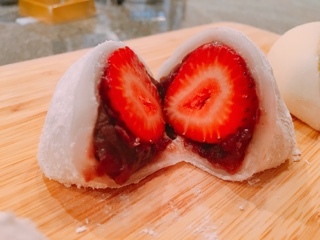 Finally, my favourite, a sweet strawberry encapsulated in a thin layer of red bean paste, which goes so well with the chewy mochi exterior. Individually wrapped, they’re great for bringing to a pot luck or snacking on. The daifuku fruit ones are also surprisingly light, so good luck sticking with just one. 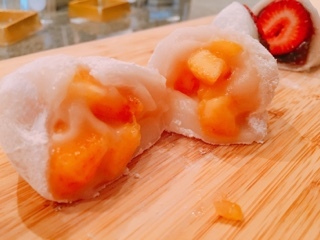 Disclaimer: The fruit mochis were provided on a complimentary basis. Rest assured, as noted in my mission statement, I will always provide an honest opinion.